1. A damages bond of £50 is required with the full balance. 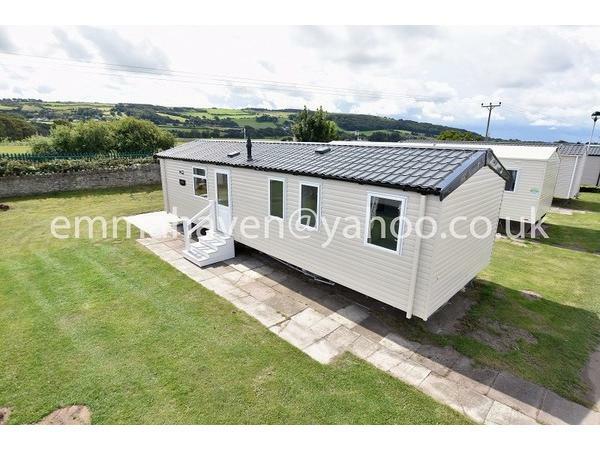 This will be paid back to you within 5 days of the last day of the holiday after a check of the caravan has taken place. The bond will be retained if theft or damages have taken place. 2. If accidental damage occurs, please do not worry! It is fully understood that accidents can happen. All I ask is that you contact me straight away so that I can organise repairs and so that we can organise the payment of this together. 3. A deposit of £50 is required to secure your booking. This will be deducted from your full balance. 4. The remaining balance of the holiday is due 4 weeks before the holiday date. Holidays not paid by this date will be cancelled and the £50 deposit will be lost. 5. The caravan is strictly NO SMOKING. If this condition is not complied with then I reserve the right to cancel your holiday. Private owners do tend to contact each other with this information! 6. The caravan is strictly NO PETS. If this condition is not complied with then I reserve the right to cancel your holiday. Private owners do contact each other with this information! 7. If point 4 and 5 are not complied with then the £50 damages bond will be retained to allow me to pay for a deep clean of the caravan. 8. Should I need to cancel your holiday due to unforeseen circumstances beyond my control (e.g. problems with the caravan) then all monies that you have paid to me will be returned back to you in full. 9. 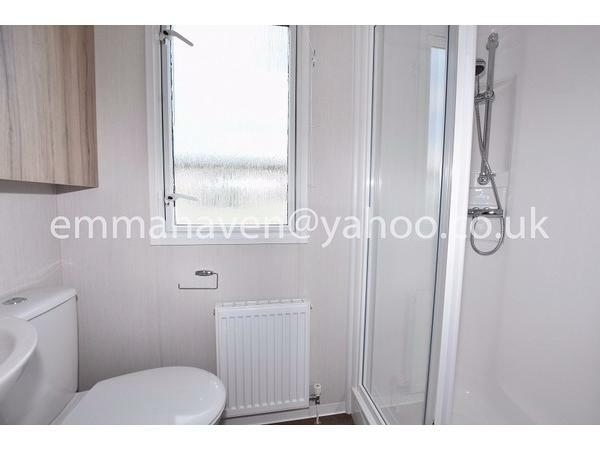 An absolute maximum of 6 people are allowed to stay in the caravan. 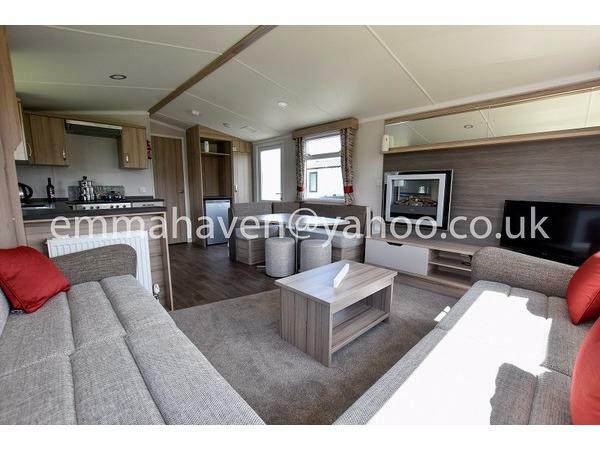 This is due to insurances and wear and tear of the caravan. If it transpires that more than 6 are staying at the caravan, the holiday will be terminated and the damages bond retained. 10. Check in is 2pm and check out is 10.30 am. 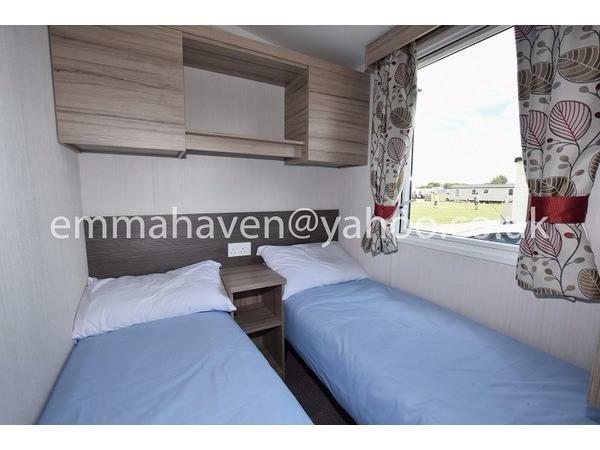 This is ensure that the cleaner has ample time to clean and make the caravan a high standard for all guests. 11. Haven passes are not included. These are available from the Haven reception. 12. Clean linen is included in the price and beds are made up on arrival. 13. Towels are not available, please bring own towels. 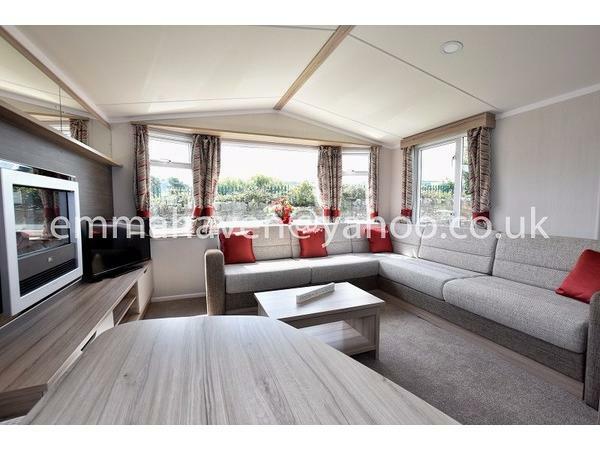 NEW CARAVAN OVERLOOKING A CHILDREN'S PLAY AREA! Price list available just email for detail. 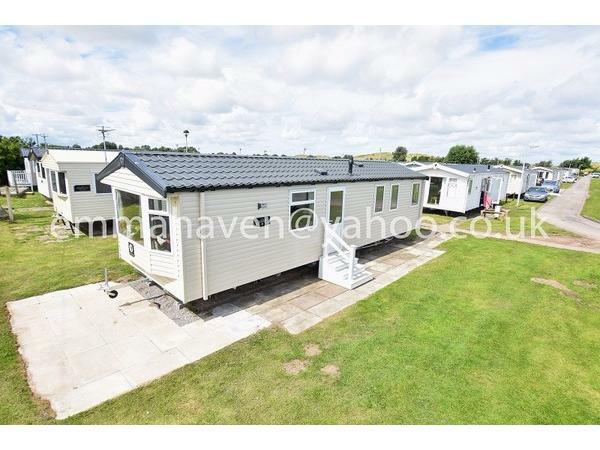 Welcome, a child friendly caravan located conveniently overlooking a children's play area, a perfect pitch for entertaining the little ones! 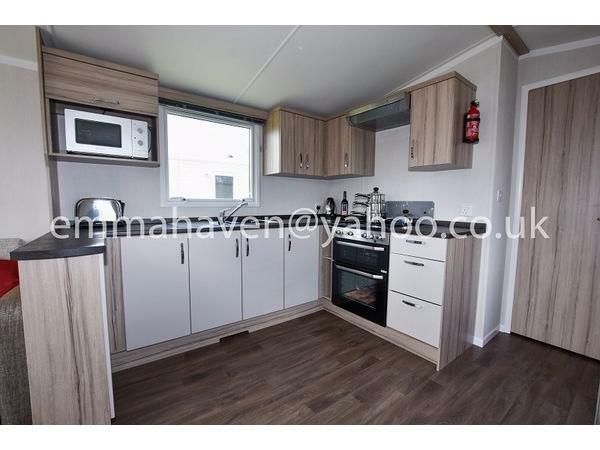 As you can see from the photos the caravan is brand new, immaculately presented and less than a 5 minute walk to the main Haven facilities! 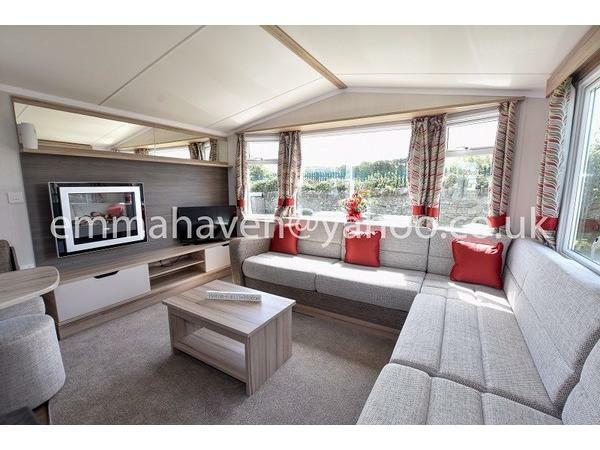 The caravan is a 2017 model and contains everything that you need for your family holiday. There is gas central heating in every room for the colder months and windows are double glazed, along with a Dimplex electric fire. There is a TV in the lounge along with a DVD player and a range of DVD'S suited to all age groups. 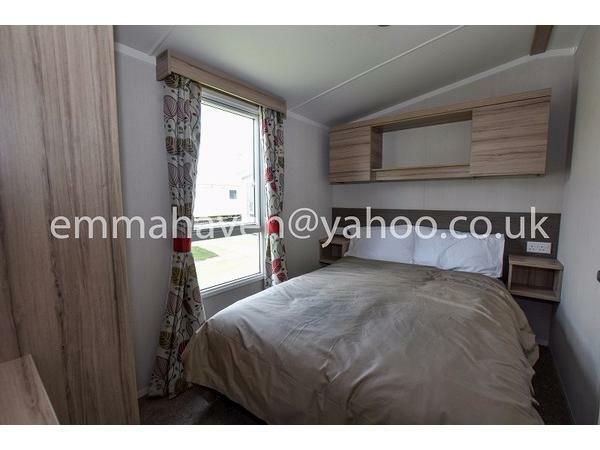 Your beds will be made up for you on arrival and the caravan will have been cleaned thoroughly ready for your stay. All you need to provide is a £50 deposit to secure your dates and then the remaining balance is due 4 weeks before your holiday date. Please get in touch with any questions that you may have. 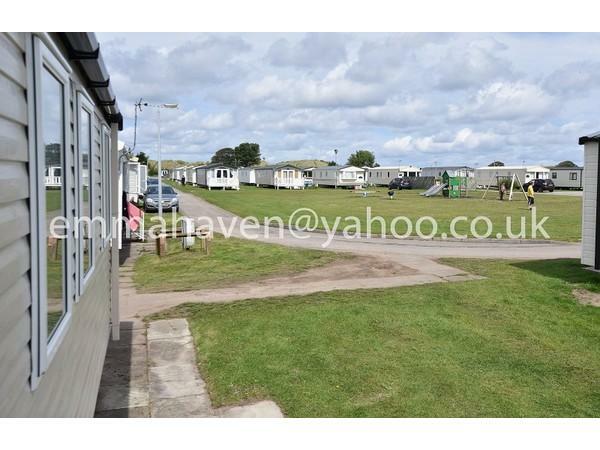 Additional Info: Indoor pool and slides.Separate children's pool.Direct access to the beach and rolling sand dunes.Heated outdoor wave pool.Mini golfFull day time and nighttime entertainment programme. A range of onsite play areas.Soft play area for young children.Sand art.Pottery painting.Go-Karts.Archery.Segways.Climbing wall.Outdoor areal adventure.Bingo.Arrange of artists and shows.Burger King on site.Papa johns including caravan delivery service on site.Mash and barrel family restaurant.Fish and chip shop.Spar.Arcade.A lovely scenic walk to Talacre bay where there are a range of pubs and facilities.Scenic walk to Talacre lighthouse.Lots more: activities and events happening throughout the year!